This genuine Louis Vuitton up-cycled tote bag is in it's own unique class. Genuine leather with a hand-laced braided top and drawstring, in addition to soft laced leather fringe down each side of this exquisite bag will definitely turn heads. 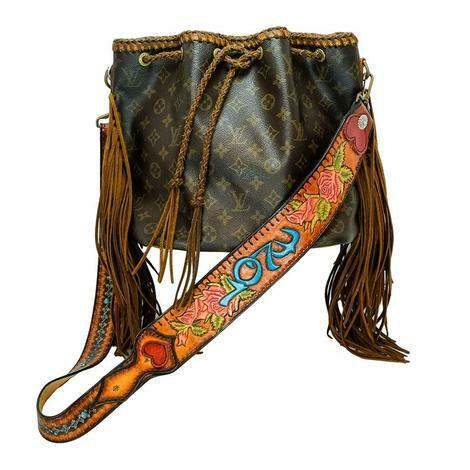 A custom tooled and hand-colored detachable strap with a bojo, hippy-style Love and Roses theme has been hand tooled and colored. Unique and wonderful bag to add to your collection.